Good evening fellow scrappers! Time for another reveal over at Color Combos Galore (CCG). The challenge for this inspiration was to use frames or framed objects to draw focus to elements on the page. Based on this, I used a chipboard frame by Dusty Attic to frame my photo. This is me sitting on a beach in El Dorado Puerto Rico last September. My page is based on how I was finally able to make peace with myself--how I'm content with both the inside as well as the outside. A few years ago I never would've scrapped a photo of me in my bathing suit. Now I can & am content I did! The journey to loving yourself completely can sometimes be a long one. But when you reach the end of that journey--it's a very fulfilling feeling. Here's the CCG challenge with all the details. I once again did my journaling in the form of a scroll. Am getting very fond of this form of journaling b/c I can write a lot & at the same time add a unique embellishment to my page. Here's the scroll rolled open. The butterflies are from my Etsy shop. I have a variety of different butterflies in my small shop. If interested--feel free to pay my shop a visit here. I also did some stamping in the background. It's a combination of a crackle stamp by Donna Salazar, script stamp by Unity Stamps & splatter stamps by Recollections. Here you can see my scroll journaling tucked in it's resting place. The makeshift 'straps' are made out of sturdy card stock. The journaling is printed on vellum. I combined several embellies to make up the the cluster of flowers going along the side. I used a rhinestone vine & flower vine by Prima and a couple of ribbon, mulberry & beaded flowers from my stash. For the chipboard frame it was first painted with a light green acrylic paint then covered with a semi-thick layer of crackle paint. I used my Dymo caption maker for part of my title. This is the first time I incorporate a banner into my page--I thought it fit this page & served as a holding place for part of my title. More embellies mixed in within my cluster of bits & bobs. The resin cabachons are by Websters Pages and the little nest with eggs is by Prima. Thanks to all of you who stop by for a visit. 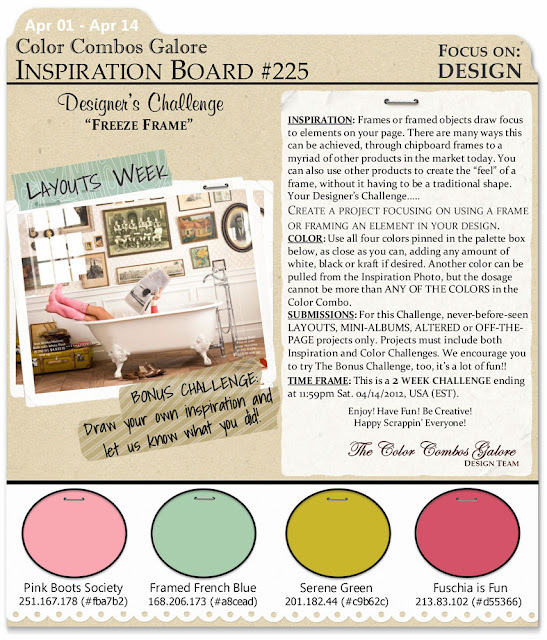 Do remember to swing by the CCG blog to see the other DT's take on this challenge & to play along! The scroll journaling is very neat and you are lovely inside and out! So beautiful....love the bright colors! Stunning...may be my new fav of yours! Kay, what a stunning Layout! You never cease to amaze me! How cute is that little bird's nest! Love what you did with the colors! Another amazing page, all the detail here are exquisite, I love the splatter stamp, I have seen it at Michaels not sure to buy, now I want! :) :) LOVE LOVE LOVE the tucked journaling, and the butterflies are adorable! So happy you have overcome your uncomfortableness with yourself, silly girl, your are beautiful!!!!!!! This is phenomenal Kay! Love what you did with the colors and that background is fabulous. Beautiful, elegant photo of you! Stunning page! Love the way you incorporated the colors in the challenge and the stamping in the background is FAB, very inspiring!!! !